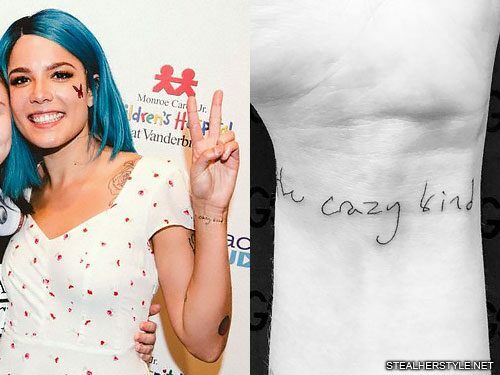 Halsey has a tattoo on the inside of her right wrist featuring the lyrics “the crazy kind” from her duet “Him & I” with rapper G-Eazy. They sing the song from the perspective of two lovers but were also a real life couple at the time. In Halsey’s sung chorus to the song she describes their love as “the crazy kind” of love. 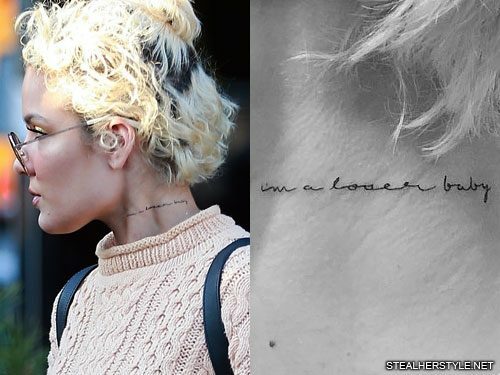 G-Eazy didn’t have any tattoos when they started dating, but Halsey changed that. The couple visited artist Jon Boy together for their first joint tattoo session in December 2017. 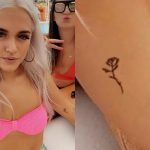 While Halsey’s tattoo pays homage to the single “Him & I,” G-Eazy got his own tattoo representing the album that the song appears on. His tattoo was of his The Beautiful & Damned TB&D skull logo on his right forearm. 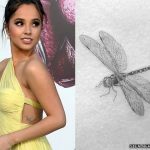 Halsey got him hooked on the art of tattoos and he’s since gotten many more. 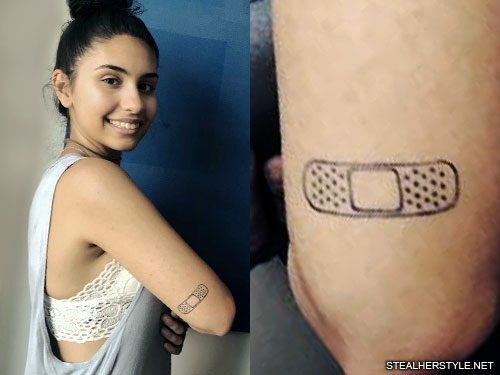 She got this tattoo in April 2013 after putting a lot of thought into planning it. 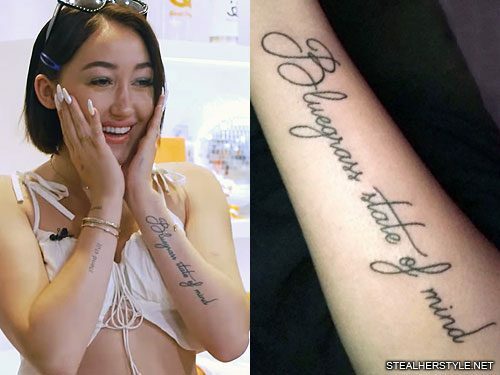 She shared a photo on instagram back in August 2012 where she edited the lyrics onto her back in two different fonts, trying to decide which she liked better. Patty Griffin is one of her influences and musical idols. “Going to see Patty Griffin at the Ryman this evening. 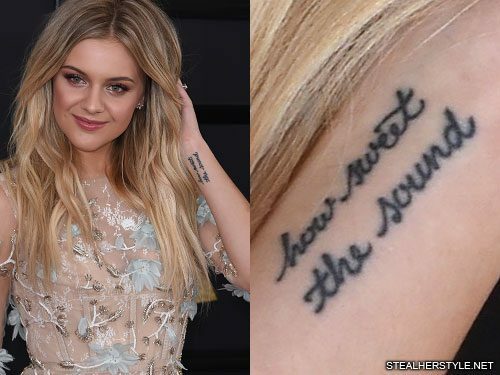 I may never come back down,” she tweeted before seeing her in concert in October 2013. 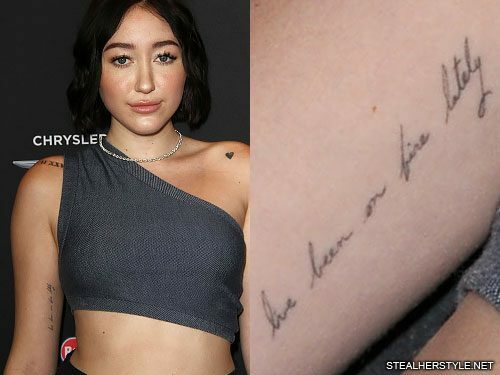 Noah Cyrus has a tattoo on her left forearm with the title of her favorite song by her dad, country singer Billy Ray Cyrus. 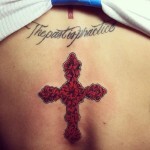 It says “Bluegrass state of mind” in large cursive letters. It’s a sentence with such a big meaning to me, from one of my favourite songs, written so thin that it looks like it is only written by pen. 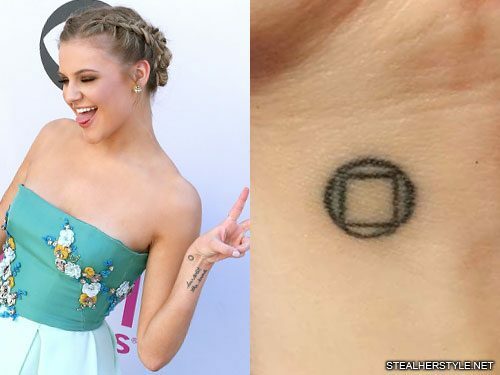 I’ve been wanting this tattoo for months and in Los Angeles I finally made my decision and made it. 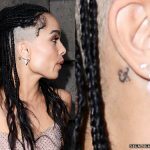 My favorite [tattoo] I got done on my last night in L.A. after Coachella by Dr. Woo, who is super good, and it’s in my handwriting; I just wrote it on paper. 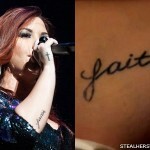 Though that was back in 2013 when she only had five tattoos, so it might not be her favorite anymore.